The Learning Zone: Instant I.D. 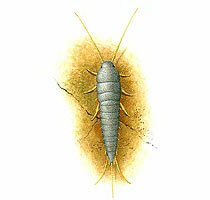 You have probably seen a silverfish scurrying around your bathroom or kitchen. They are small, fast moving and often covered with silver scales, giving them their fishy appearance. These species are pests and feed on flour, textiles, paper, and wallpaper paste. Find out about different types of insects. Return to the list on the Instant I.D. homepage and click on another link.